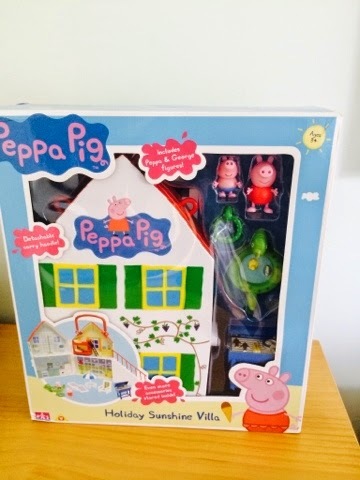 Peppa Pig Holiday Time Sunshine Villa. 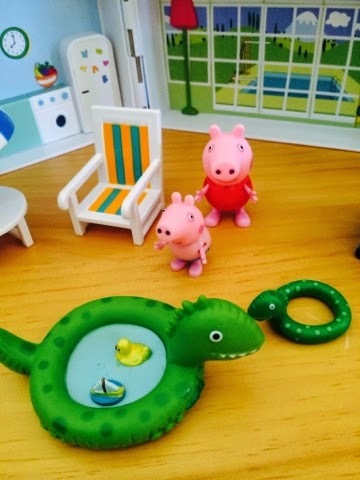 Peppa and George are in the holiday villa! 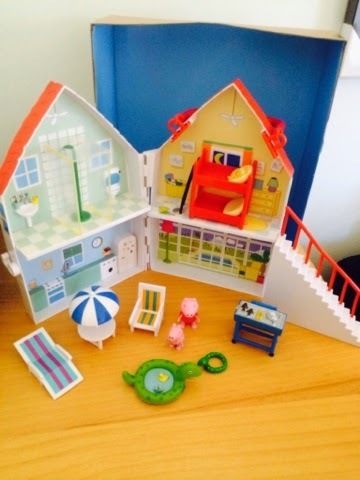 Open up the playset and play with George in the paddling pool! 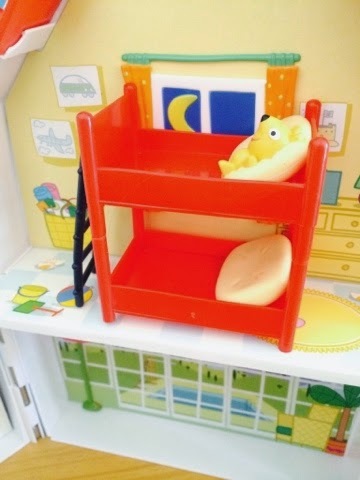 There's lots of holiday accessories and furniture for holiday fun. Also includes a carry handle and packs away for easy storage. 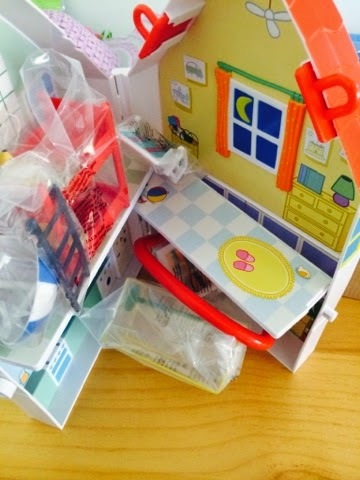 The packaging is exciting - you can have a glimpse at what's inside, Maegan age 3 kept peeping at all the little accessories but there was even more hidden inside so we had a big "OOHHHH WOW" which I always love to hear! Maegan had had a bit of a rough time with a nasty illness (Lymphadenitis) so it was really lovely to see her excited and playful, I couldn't get everything out fast enough for her! 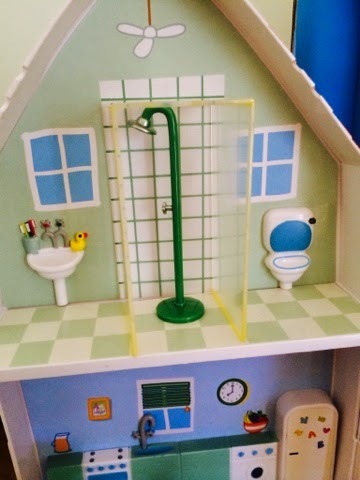 Love the moulded details that work well alongside the accessories such as the removable show unit. 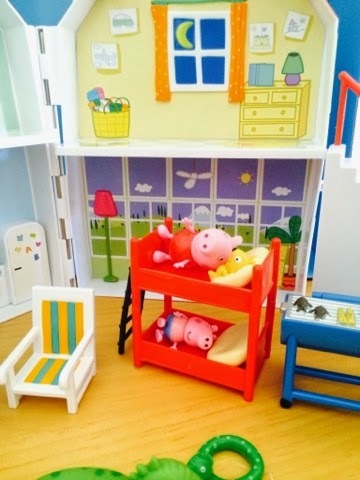 Peppa's bunk bed is a big hit! 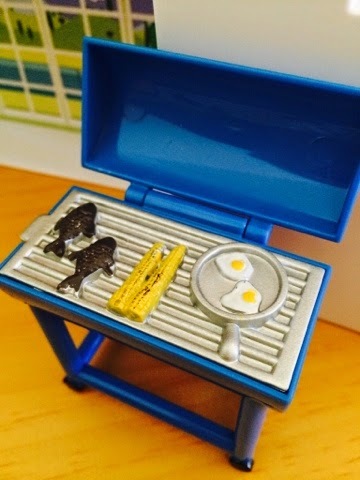 This clever BBQ has a reversible grill, simply clean it by flipping the food side down to reveal an empty grill! 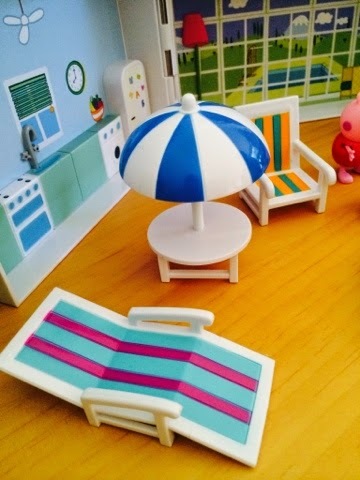 Peppa and George can chillax on the sun lounger or sit under the parasol when its too hot. 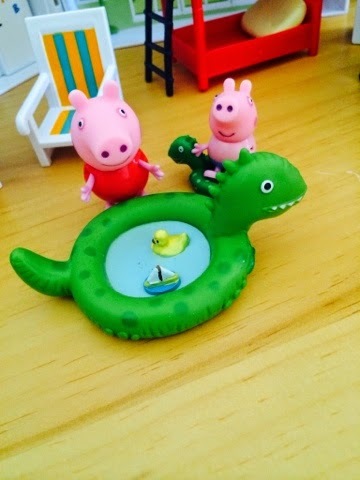 Peppa and George are ready for a splash! 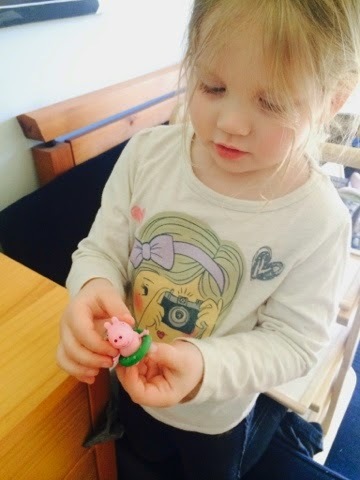 Maegan Darcie (Age 3) Loves putting George in his rubber ring. Blake (age 5) just couldn't resist joining in too! Well this is just brilliant! - Look! 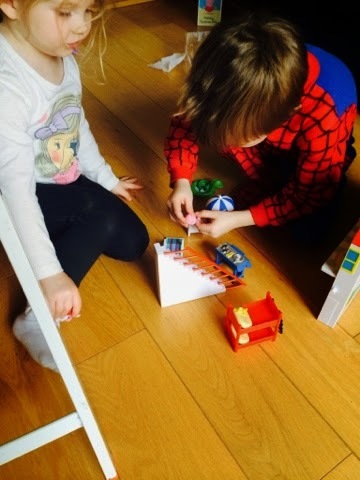 the Villa is big enough for two to play at the same time, and they are playing nicely! 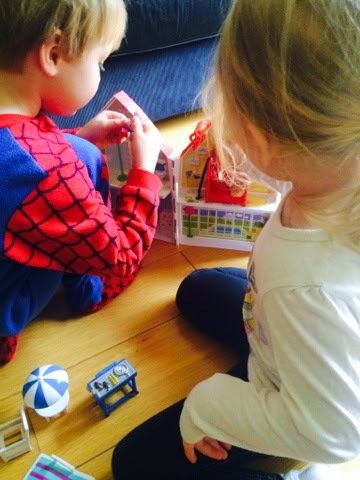 The new collection is the same size as previous ones such as the Peppa Pig funfair so they are all compatible. 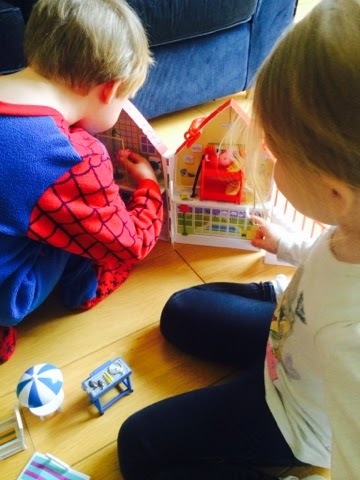 My children enjoyed playing with the Peppa Pig Holiday Time Sunshine Villa and we love that it packs up into a handy carry case making it the perfect travel (or playdate) companion - Maegan (age 3) loves Peppa and enjoys playing with Peppa toys, Blake (age 5) is moving away from watching Peppa, he prefers other programs now but he still very much enjoyed playing with this playset and will often join in with meg when she's playing with her Peppa pig toys. 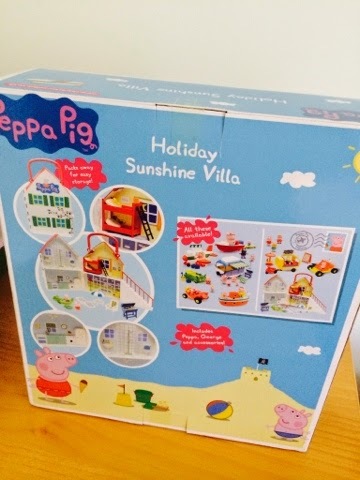 I received Peppa Pig Holiday Time Sunshine Villa playset for the sole purpose of reviewing it.